The Sherpa of Nepal are a distinct group from the Helambu Sherpa. A sub-group of the Bhotia, the Sherpa are a Tibetan-related ethnic group living in the high valleys of eastern Nepal. The name Sherpa is derived from the Tibetan word sharpa, meaning "people from the East." The Sherpa are a warm and friendly people, ingrained with kindness and generosity. Most Sherpa live in the Solu-Khumbu region in the northern part of the Sagarmatha district. However, several thousand Sherpa live in colonies in the Nepali capital of Kathmandu, in the city of Darjeeling, and in Indian hill towns. Most Sherpa villages are located on the southern slopes of the Himalayan range around the base of Mount Everest. The Sherpa are skilled guides and porters. In 1953, they gained worldwide attention (as well as a tourist industry) when a Sherpa climber named Tenzing Norgay accompanied Sir Edmund Hillary to the summit of Mount Everest. Sherpa villages range anywhere from a few households to more than one hundred houses. A Sherpa family unit consists of the nuclear family living in a single household and sharing a joint economy. Houses are at least two stories, the upper story being a one-room living quarter and the lower story serving as an animal shed and storage area. When the youngest son marries, he inherits the farmhouse and half of the fields. He also must take care of his parents. The older sons receive the remaining fields as their inheritance. A middle son will often bring honor to his family by attending a monastery in order to become a lama, or holy man. In the past, marriages have always been arranged by the family. This tradition seems to be changing with the increase of Western influence. Also, divorce is quite frequent, occurring in an estimated one-third of Sherpa marriages. There are few government schools in the Solu-Khumbu region, making it necessary for children to walk long distances to school. For this reason, children do not attend school regularly, although the government requires three years of education. It may take a child six years to complete this requirement. The lack of education among the Sherpa has resulted in a literacy rate of only less than one-third. Trading is an important economic activity for the Sherpa. The men make long trading expeditions and are often gone for many months, leaving the remaining duties to the women. The Sherpa often act as middlemen between Tibetan traders and those from the lower-lying regions of Nepal. Working as middlemen has enabled the Sherpa to attain higher standards of living than those of other hill people. Tourism provides the Sherpa with alternative activities and sources of income. The people use their homes as overnight shelters for mountain-climbing expeditions, and they also work as cooks, porters, and guides. Overall, tourist-related jobs are becoming more and more prevalent in Sherpa economy. The Sherpa language is a dialect of Tibetan and is part of the family of languages to which many other Nepali languages belong. 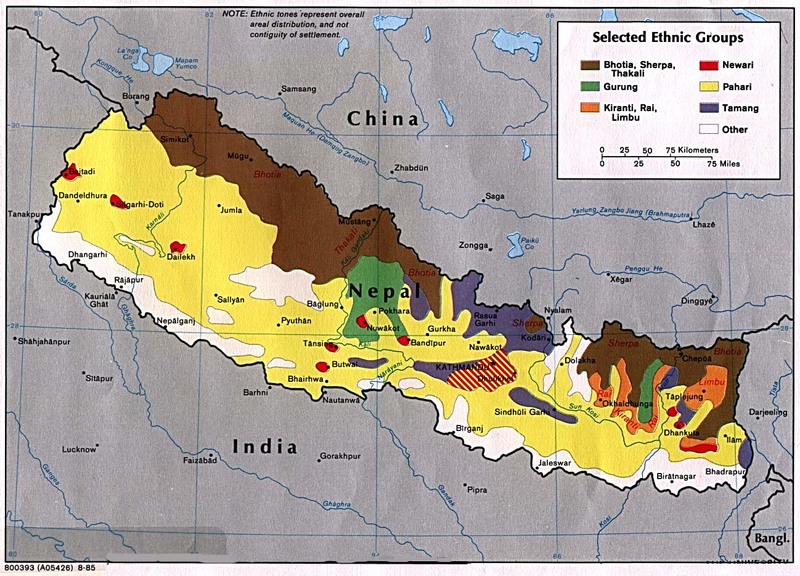 All Sherpa speak Nepali, the official language of Nepal. While Sherpa is not a written language, many Sherpa are literate in Tibetan, Nepali, and occasionally, Hindu and English. Religion has a very strong hold on the Sherpa. The Sherpa generally follow the Tibetan form of Buddhism combined with animism (the belief that non-human objects have spirits). These beliefs encompass everything the Sherpa do. They follow folk beliefs and perceive spirits everywhere. The Sherpa celebrate many festivals that involve a combination of religion and magic. Only a small percentage of the Sherpa have been reached for Christ. The people need much prayer so that their hearts will be prepared to receive the Gospel message. * Ask the Lord to send forth laborers into Nepal to minister to the needs of the Sherpa. * Ask the Holy Spirit to grant wisdom and favor to missions agencies currently working among the Sherpa. * Pray that Christian materials will be translated into the Sherpa language. * Pray that God will give Sherpa believers boldness to share the love of Christ with their own people. * Ask the Lord to bring forth a strong and growing Sherpa church for the glory of His name!View Sherpa in all countries. Location in Country: Solu Khumbu District, Sagarmatha Zone.